Pressure was applied on the rebels from all sides to lay down arms and leave Aleppo. Russia applied military pressure with intense and continuous bombing. Turkey’s role was to apply political pressure to the rebel groups under its influence. It pushed them first to leave the fronts in Aleppo to join its “Euphrates Shield” operation in the north from August, then to not fight as the regime invaded in November and finally to be evacuated after the invasion in December. Aleppo was given to the Assad regime on a silver platter. The role of Russia in all this, likewise Iran, comes as no surprise. The role of Turkey and Erdoğan, however, is difficult to digest for many who have pinned their hopes on him as the model Muslim ruler and potential saviour of the Muslim world. Erdoğan’s recent moves in Syria have a different story to tell. In this essay, we look at the Turkish role in handing over Aleppo to the Assad regime, within the broader context of the normalisation and strengthening of ties with Russia and Turkey’s Operation Euphrates Shield. When rogue elements of the Turkish Air Force downed a Russian jet on 24 November 2015, diplomatic relations between the two nations came to a standstill, with severe restrictions placed by Russia on Turkish trade, travel and lucrative energy projects. This represented a significant economic blow to Turkey, given that Russia was her second largest trading partner. The Kremlin was unequivocal that relations would not resume until Turkish President Recep Tayyip Erdoğan issued a formal apology for the downing of the Russian jet. In late June 2016, Erdoğan obliged, apologising and vowing to take action against those responsible in a letter addressed to Russian President Vladimir Putin. Consequently, sanctions were lifted and projects resumed as Turkish Foreign Minister Mevlüt Çavuşoğlu announced that there should be no obstacles to trade between Turkey and Russia. Lavrov and Çavuşoğlu meet in Sochi, July 2016. Following the apology, relations between Moscow and Ankara warmed quite quickly and meetings between top officials took place with remarkable urgency. 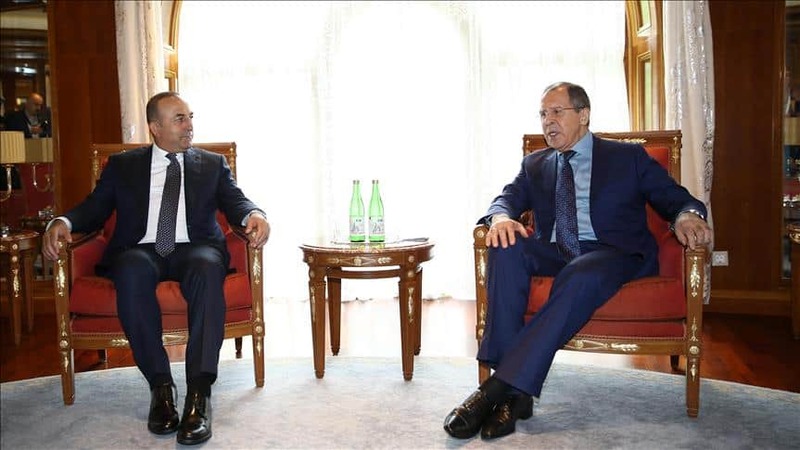 Russian Foreign Minister Sergey Lavrov met his Turkish counterpart Mevlüt Çavuşoğlu almost immediately on 1 July 2016 at the Russian Black Sea resort of Sochi on the sidelines of the Black Sea Economic Cooperation Organization (BSEC) Council of Ministers of Foreign Affairs. Following this, Presidents Erdoğan and Putin met in person three times in two months. 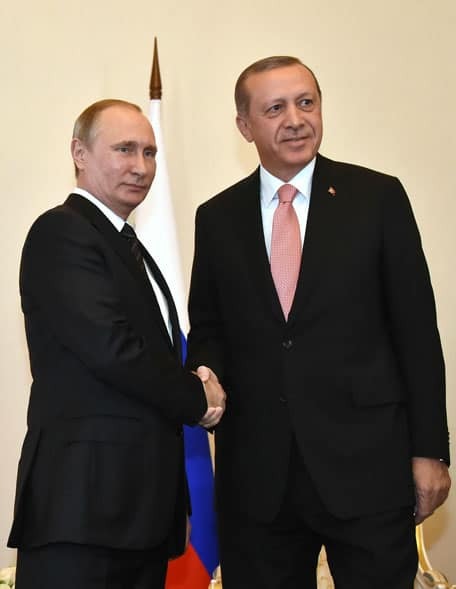 Erdoğan went first to meet Putin in St. Petersburg on 9 August 2016, then they met on 3 September during the G-20 Summit in Hangzhou, China, and finally Putin visited Istanbul on 10 October. Putin and Erdogan meet in St. Petersburg, August 2016. It is important to note that this process of normalisation of ties between the two countries began before the failed coup attempt in Turkey on 15 July 2016. Many commentators have mistakenly read the Russian-Turkish rapprochement as a post-coup move by Turkey caused by its dissatisfaction with the western response to the coup attempt. However, this is not at all the case. The Turkish apology, the Russian acceptance thereof and even conciliatory meetings between top officials all came before the failed coup attempt and continued thereafter. At most, the process was marginally slowed due to Ankara’s occupation with its response to the coup attempt. One of the important decisions to come out of the St. Petersburg summit was the establishment of a three-pillar mechanism based on enhanced consultations between the two countries’ foreign ministries, intelligence agencies and general staff units. The first meeting of this new initiative was held almost straight away in Russia on 11 August, and aimed to develop a much more extensive political and military dialogue between Ankara and Moscow. In turn, top military officials have had multiple meetings since then. Russian Chief of General Staff Valery Gerasimov visited Turkey in September, with Turkish Chief of General Staff Hulusi Akar visiting Moscow in November. The Russian plan was thus quite straightforward: de-legitimise all resistance brigades as “terrorists” grouping them with ISIS, including, in particular, Jabhat al-Nusra (now Jabhat Fath al-Sham), create an artificial wedge between these “radical” factions and other “moderate” ones, consider all those who do not comply as the former, then bomb them into submission. In this way, it would assist the Assad regime re-take lost cities and also impose a “political solution”. Turkey signed on to this plan from as early as the Lavrov-Çavuşoğlu meeting in Sochi. Before moving to the handover of Aleppo itself, a couple of points are worth emphasising. 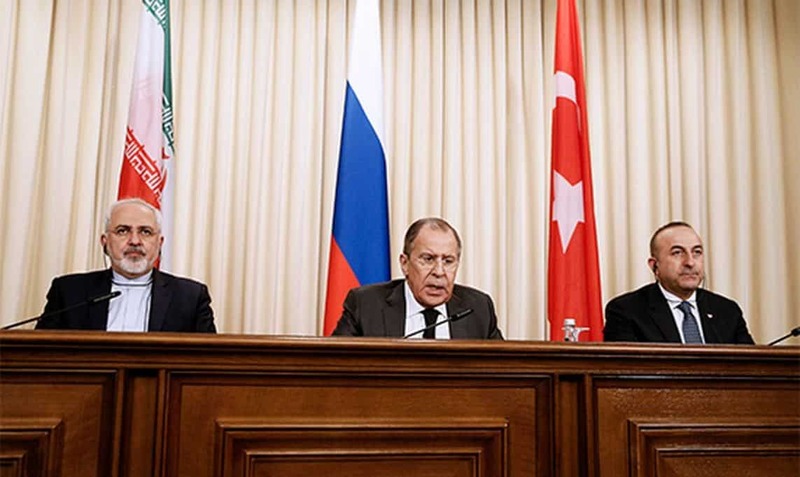 First, as demonstrated above, Russian-Turkish plans for Syria, working towards a ceasefire en route to a “political solution” began as early as July 2016, six months before the invasion and handover of Aleppo. The handover was planned and premeditated, contrary to readings that suggest Erdoğan decided, only after seeing Aleppo being inevitably lost, to cut losses and make the most of the bad situation. This latter reading falls to explain why the situation on the ground in Aleppo changed so drastically and also to take into account the series of Russia-Turkey meetings and agreements that begin from July 2016. Second, it should be noted that the Russian agenda in Syria is neither entirely independent of nor in conflict with the US agenda as trumpeted by some elements of mainstream media. Naturally, both have their own regional political and economic interests in mind, but there is no significant conflict between the two on the path to that end in Syria. Both Russia and Turkey are working very much within the US agenda and the US, far from being “sidelined”, has been part of and leading the process throughout albeit using different styles and means at different times. This can be demonstrated with ease by following the American movements on Syria in the last year. We do not do so here as it is beyond the scope of this piece. Suffice it to say that the Russian narrative and objective is entirely within parameters previously agreed to with the US since late 2015. As co-chairs of the “International Syria Support Group” (ISSG) – convened in November 2015 six weeks after Russia’s military intervention in Syria – the US and Russia have been working together, leading the response of the UN and “international community”, on broadly the same agenda in Syria: a “political solution” whereby the “Syrian Opposition” and the Assad regime would sit together, after the imposition of a ceasefire on the ground, to form a unity government and work towards a transitional period and then the formation of a new constitution and government. Of course, this new constitution and government would be secular – as stipulated by the Geneva Declaration and UNSC Resolution 2254 which mention facilitating a secular government in Syria and the Vienna Statements which declare that “Syria’s unity, independence, territorial integrity, and secular character are fundamental” – and acquiescent to the regional political and economic interests of foreign powers as with all other regimes in the region. This was essentially the same agenda – in origin an American agenda – expressed in the Geneva Communiqué of 2012, the Vienna Statements of November 2015 (which established the ISSG), the UN Security Council Resolution 2254 of December 2015 (whereby the UN endorsed the strategy of the ISSG), the Munich Statement of the ISSG in February 2016, ‘The Cessation of Hostilities’ Accord of the ISSG signed on 22 February 2016 by both the US and Russia, and the Vienna Statement of the ISSG of May 2016. All of these mention the same things Russia has been parroting ever since, such as the need to impose a ceasefire, one that did not apply to “terrorist organisations” including Jabhat Fath al-Sham (JFS), against whom military actions of the US, Russia and the Assad regime would continue. The more recent ‘Moscow agreement’ signed by Iran, Turkey and Russia in December 2016, whilst portrayed as sidelining the US, stipulates these very same core points, explicitly citing UN SC Resolution 2254. Aleppo, the symbolic heartland of the revolution, had been a bone in the Syrian regime’s throat for four years. It had been a stalemate between the regime and resistance groups with neither able to take full control. The resistance groups had a strong grasp on the areas they controlled. In fact, early August saw the resistance on the front foot with its tail up as it broke the regime’s siege of the city in spectacular style. Yet, in spite of all this, come December and the regime simply walks across large parts of Aleppo as if facing no resistance. The devastation of Aleppo by Russian bombs in Nov-Dec 2016. Indeed, it was the withdrawal of the rebel groups that allowed the Syrian Army to take the city with such ease after four years of being unable to do anything of the sort. The political spin deployed was that Turkey had done great work by evacuating civilians after the invasion. What was hidden was that Turkey had evacuated rebel groups before it and pushed others still there to not fight, allowing the invasion in the first place. This did not, of course, arise out of a vacuum. It was the result of Turkey working hand-in-hand with Russia on the Syrian file for months as demonstrated above. Putin and Erdoğan at the World Energy Forum in Istanbul, Oct 2016. A few days later, the Turkish Foreign Minister re-iterated this during international talks on Syria in Lausanne, telling reporters after the meeting that JFS must withdraw from military posts in Aleppo immediately for humanitarian aid to reach the city safely. Humanitarian aid was used as blackmail for the achievement of political ends. Little wonder, then, that with such co-operation in play with Russia, Erdoğan had not even words of condemnation for what Russia and Assad did to Aleppo. At the same time, he was quick to claim credit for subsequent evacuations of civilians and rebels. In these too, Turkey worked closely with those responsible for the devastation and bloodshed in Aleppo, Iran and Russia. 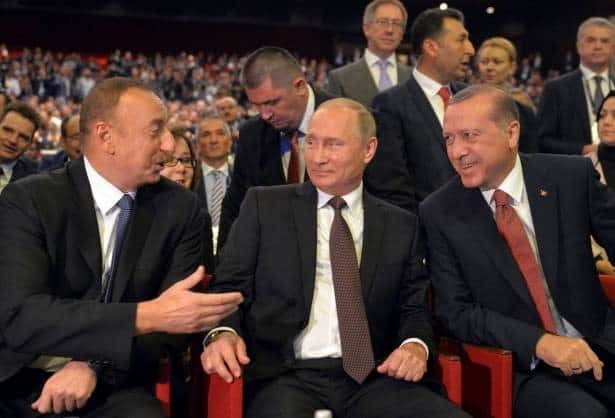 Çavuşoğlu, while praising and justifying Russia’s intervention, declared in late December, “in this period, Russia and Turkey have trusted each other on strategic issues. Turkey and Russia have mutual trust in each other,” and Iranian Foreign Minister Mohammad Javad Zarif said to his Russian counterpart that, “we, you and Turkey have been able in the past five days to help evacuate innocent civilians from Aleppo as well as (facilitate) the terrorist groups to leave the city.” The “terrorist groups” being the resistance groups, not, it should be noted, including ISIS which has no presence in Aleppo. 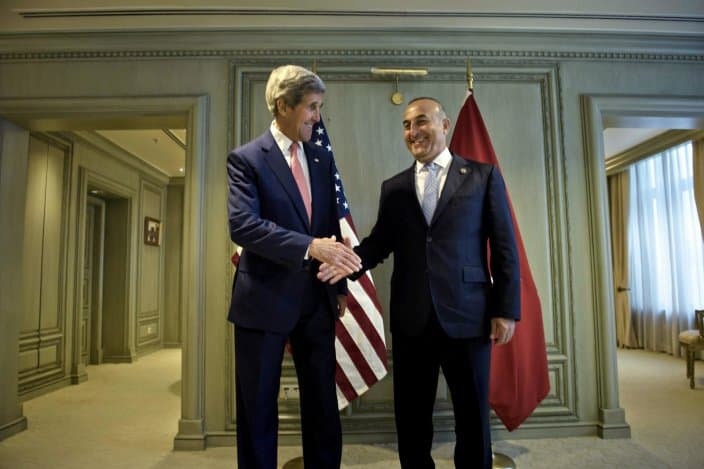 Cavusoglu and Kerry meet in August 2016, prior to the launch of Operation “Euphrates Shield”. Turkey’s military intervention in northern Syria, named “Operation Euphrates Shield”, began on 24 August 2016. 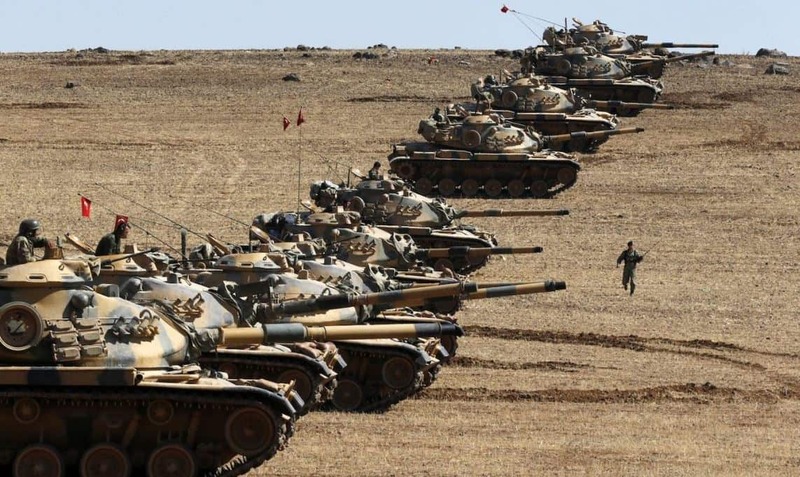 The operation aims at creating a buffer zone to push ISIS away from the Syrian-Turkish border while also, and more importantly for Turkey, forestalling the creation a contiguous Kurdish-held region in northern Syria. It would do this by clearing the regions extending from Azaz to Jarablus from ISIS and YPG (People’s Protection Units) – the armed faction of the Kurdish PYD (Democratic Union Party) – forces. It would also be the perfect means for Erdoğan to deliver on his deal with Russia to push rebel fighters out of Aleppo. Thus, Erdoğan diverted thousands of rebels to help him clean up the border region when they were desperately needed in Aleppo. Turkey pushed the Syrian rebel groups under its influence to participate in the operation. Ankara’s use of rebel forces as a proxy force for this operation drew thousands of rebel fighters away from their war against Assad, weakening opposition lines in Aleppo. This came not long after the breaking of the siege at Ramousa in early August and subsequent regime intensification of attacks in Eastern Aleppo to make the crossing unusable and re-establish the siege. At a time when Aleppo needed all the fighters it could get, significant numbers of rebels from the Aleppo region were pushed by Turkey, and paid, to stay on the border front, instead of returning to their home city to fight. Turkey enters Syria for her “Euphrates Shield” operation, August 2016. Estimates place the number of rebel fighters taking part in Euphrates Shield at some 5,000 Free Syrian Army fighters, including groups from the Sultan Murat Brigade, Suqour al-Jabar, Fath al-Sham Front and Faylaq al-Sham. Five thousand is a substantial number. For comparison, estimates place the total number of fighters in the Jaysh al-Fath-led operation that captured the Artillery Academy and broke the siege at Ramousa in southwest Aleppo in early August at 6000-8000. It was many of these, but also others, that were then moved away from Aleppo to Jarabulus for Turkey’s Euphrates Shield operation. Erdoğan’s decision to pressure the rebel groups under his influence to allow thousands of its fighters to abandon the effort to lift the regime siege of eastern Aleppo in order to spearhead the Euphrates Shield ensured the fall of Aleppo four months later. For many of the rebel leaders who left Aleppo, before or after its fall, to join the Turkish intervention in the north, this was part of broader efforts to eventually re-take Aleppo. In October, a commander from the Sultan Murad Brigade named Ismail said, “Our most important target is to break the siege of Aleppo […] This is our own idea, but in the coming days we will discuss this with our Turkish brothers.” 40-year-old rebel Bessam Muhammed said, “We haven’t come all the way and fought this war to seize Jarablus and then stay here,” and Mahmud, 26, an FSA fighter stated, “We don’t want to stop here or in al-Bab. Next is Aleppo.” Turkmen Front Brigade Commander Firaz Paşa, upon leaving Aleppo through the negotiated evacuations, said: “We are among the last six people who are leaving Aleppo ultimately. However we will return to Aleppo and fight to retake the control of our homeland.” Turkey, on its part however, has been unequivocal in declaring that Aleppo is absolutely not part of its plans. As at August 2016; Source: AFP. The Euphrates Shield operation started with the border town of Jarablus, held by ISIS at the time, where Turkey found quick success in driving out ISIS, pushing them to al-Bab, which Turkey has since been focused on clearing, with Russian aerial support. At the same time Russian planes were bombing Aleppo to assist the Assad regime, they were bombing Jarablus and al-Bab to assist Erdoğan’s Euphrates Shield. Manbij is another city that Turkey has its eyes on. The city had been held by ISIS, but in mid-August 2016 Kurdish forces were able to capture it. This has created a situation where there is Kurdish-controlled Manbij and Afrin on two sides with ISIS-controlled al-Bab in the middle. Turkey wants to take al-Bab to prevent the Kurdish forces from taking it and thereby connect their two sides of territory along the Turkish border. Turkey’s operation against the Kurds is significant because the YPG has been openly supported by both the US and Russia as one of the most effective fighting forces in the Syrian conflict, specifically against ISIS. Turkey has been dissatisfied with this, since it regards the Kurdish forces as terrorists. Turkey demands that the Kurds withdraw to the east of the Euphrates River and both the US and Russia have accepted this demand, in exchange for Turkey playing its part to serve their agenda in Syria. The Foreign Ministers of Iran, Russia and Turkey meet in Moscow, Dec 2016. Turkey is now running fully in line with the American-Russian agenda and narrative. Beyond the official meetings and declaration, much is afoot behind the scenes. Reports suggest that Putin has struck a series of backroom understandings with Erdoğan, and also that Iran has agreed to play a role on the condition that demands for Assad to go are dropped. Turkey’s role in the alliance, apart from turning a blind eye to the continued brutal aggressions of Russia, Iran and Assad, is primarily to make the rebel groups under its influence comply, a task it has said it guarantees. Turkey has pledged to continue its efforts in Syria on the basis of the Geneva Declaration and UN Security Council Resolution 2254, in other words, the US agenda for Syria. This is how Yahya, a Turkmen resident of Jarablus, with his wife and five children back in Aleppo, summed up the situation in October 2016. Subsequent developments only affirmed the accuracy of the description. With the normalisation of ties with Russia followed by intensive dialogue and co-operations on all fronts, the Turkish regime has played a pivotal role in handing over Aleppo to the Assad regime. 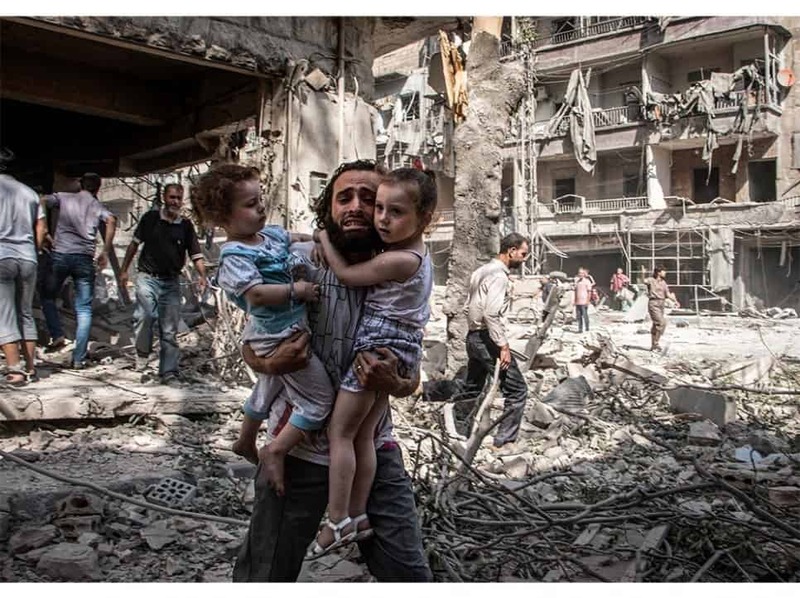 Through military and intelligence collaboration with Russia and Iran, as they rained terror on Aleppo alongside the Assad army, Turkey pulled the strings of rebel brigades under its influence to either move elsewhere or not put up a fight. Erdoğan has played a central role in turning the tide in Syria. What the American’s and Russians could not achieve militarily has been facilitated politically by Turkey. Momentum is now with the Assad regime and Erdoğan, having chosen to ally himself with the likes of Putin and Rouhani, has been essential in making that happen. All of this should give those who continue to support Erdoğan reason to seriously re-consider their position. Make no mistake: Erdoğan facilitated the invasion of Aleppo. This is betrayal of the highest order. It is one thing to not come to aid of the oppressed because of claimed lack of ability. That is a potentially valid claim, depending on the validity of the claim of inability. It is another thing to facilitate the oppression of the oppressed by explicitly siding with the oppressors. There are no excuses for that whatsoever. Hamzah Qureshi is an Arts Graduate with a major in Islamic Studies and Honours in Politics. He is the media representative of Hizb ut-Tahrir Australia. Uthman Badar is a writer and student of Arabic, the Islamic sciences & Continental Philosophy and an activist with Hizb ut-Tahrir Australia. Sputnik, Normalization of Russia-Turkey Ties to Help Settle Syria Crisis – Envoy, 30 Jun 2016. Sputnik, Normalization of Russia-Turkey Relations to Help Syrian Settlement, 12 Jul 2016. Ministry of Foreign Affairs of the Russian Federation, Foreign Minister Sergey Lavrov’s remarks and answers to media questions at a news conference following the 34th session of the Council of Foreign Ministers of the Member States of the Black Sea Economic Cooperation Organisation, Sochi, 1 Jul 2016. Sputnik Turkey, Rusya, Türkiye ve İran’ın ortak Suriye bildirisinin tam metni yayınlandı, 21 Dec 2016. Sputnik, Russia-Turkey Intelligence Sharing in Syria Signifies Major Changes in Relations, 26 Oct 2016.